What do a sunken whale carcass, a sunny patch in a dense forest, and your intestines at birth have in common? Answer: they each offer a fresh glut of resources to the organisms that can arrive and exploit them. As individuals and new species continue to appear, they actively and passively alter the environment. Competition for shared resources increases, local abiotic and biotic conditions shift, and the relative abundances of species change accordingly. The process is called ecological succession, and it is one of the earliest and most well-known concepts in ecology. Classical examples of succession, like those on fallen whales and in forest gaps, are relatively well understood. That is, the progressions of colonizing species over time in these systems are roughly predictable, and the central mechanisms driving species turnover are generally known. Unfortunately, succession in our gastrointestinal tracts, which transpires over the first few years of life and results in a diverse microbial community that performs functions critical for human health, is less well understood. This is partly because the gut system is so much more complex than a fallen whale. Instead of being a lump of cetaceous substrate on the ocean floor, the gut is a dynamic system in which microbes interact closely with the maturing host, resource availability changes constantly with diet, and immigrant arrivals vary with the activities and environments of the host. Even more confounding, research suggests that exposure to particular taxa at birth, which can vary with the mode of delivery, can have lasting effects on gut community composition and host health. For these reasons, in our new paper in Nature Communications entitled “Trait-based community assembly and succession of the infant gut microbiome,” we take a distinctly community-ecology approach to studying the central mechanisms of succession in the human infant gut. Importantly, we chose to focus on how trait-based community composition changes over time, rather than taxonomic composition. Our focus on traits over taxonomy let us think more clearly about the exogenous forces shaping community composition, as well as the influence of gut community composition on itself and the host. To perform our analysis, we combined previously-published gut sampling data from 56 infants in northern Europe, and trait data curated from literature and online databases. Because the trait values of most gut taxa were not directly known, we generated predictions using the assumption that traits were phylogenetically conserved. Our results showed significant decreases in the abundances of oxygen tolerant taxa over time, reflecting the increasingly anoxic gut environment as the infants mature, and decreases in the mean number of 16S rRNA gene copies among taxa, a genomic trait related to maximum potential growth rate, suggesting that rapid growth becomes less advantageous over time. We also saw a steady decrease in the abundances of taxa with flagella, and an increase in the prevalence of sporulating taxa, a trait that may facilitate between-host dispersal. 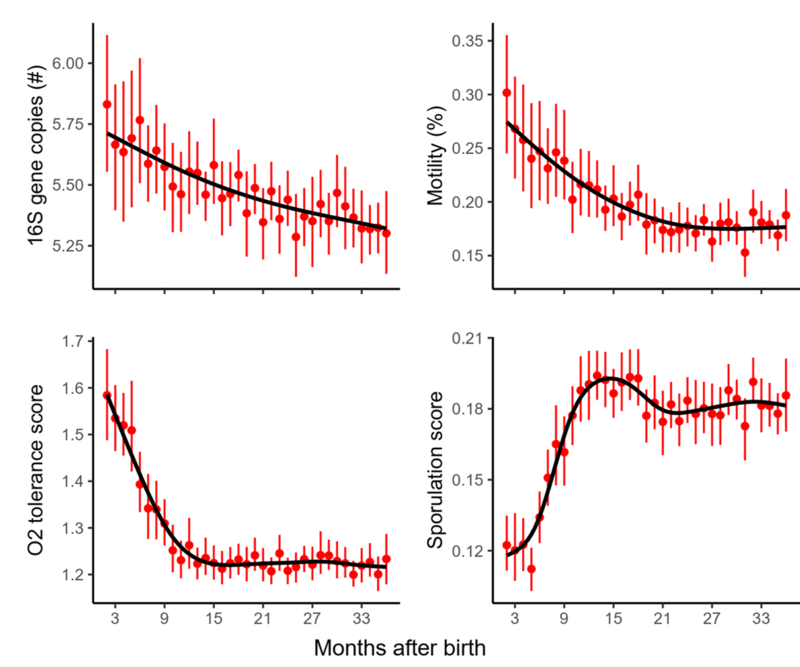 Intriguingly, we also found that the trait-based compositions of infants converged (i.e., became more similar across infants) over time, highlighting the apparently deterministic nature of gut community assembly. Trait-based approaches, which link organismal structures to ecological functions, are poised to advance our mechanistic understanding of the gut microbiome, and their usefulness will only increase as we improve our knowledge of how traits mediate microbial interactions and as we increase the depth and breadth of microbial trait databases. Ecological diversity promotes health risks opportunity for quality human process reengineering development.